We offer a unique service of planed all round Oak. This allows you the customer to order your exact required dimensions and not have to worry about waste, cut offs and most important of all, your time cutting the Oak to size and running it through the planer. We will grade and select the boards ready for machining to match your order and we also take great care and understand that consistency is important throughout your order process. Our Planed all Round Oak is planed using the latest timber machinery. We allow up to 10mm on all four edges to ensure the finished pieces are perfectly flat. If you would like any advice on our planed all round hardwoods then please feel free to give our very experienced sales team a call and we would be more than happy to help you through your project from start to finish. Please note you are entering your finished width and thickness in millimeters and your length in meters. Prime Grade Kiln Dried European Oak Selected Prime grade oak is our top grade of European oak. It can contain small pin knots and few colour variations with no major defects. 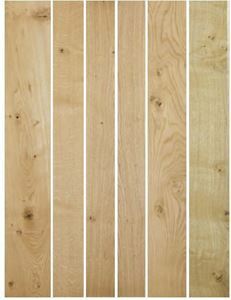 Character Grade Kiln Dried European Oak Selected Character grade oak contains knots and usually some colour variation which is selected to give you a natural distinctive appearance. Please see pictures for an understanding of the difference between the grades.